As it turned out, Ben was really the only person who truly captured any carefree moments that holiday. While he dabbled in song writing, poetry recitation, fine dining, oil painting and rendering Hafiz in arabic script, the rest of us scrambled. You may recall my heartfelt post after I worked many weeks on a braided rug for Ben, one that ended up being the size of a tea cozy. Had others in the family had their own blogs, you also would have read about their angst at receiving half baked crafts from me while Ben got a real present. In my own defense, we all knew Ben would be the one to reckon with during Homemade Holiday. After all, his idea of a moroccan feast requires the growing of lemon trees to make one’s own preserved lemons. I had no choice but to gear up with him as my numero uno craft target. Predictably, he blew all of us out of the water with his full throttle renaissance man behavior. And again, in my own defense, I started with his present first but really didn’t think this would mean his present would also be the last one I worked on. Those of us who lost our sense of life purpose, our confidence in our time management skills and our self identity as crafty (ie everyone else in this high drama except Ben) were relieved to get a reprieve from battle when we went camping last December and gave Homemade Holiday a miss. But as 2011 rolled towards a close at a shockingly swift pace, we found ourselves in Homemade Holiday territory way too soon with Ben yelling a silent cry of CHICKEN when anyone suggested backing away from a second simpler kinder Homemade Holiday kind of season. Elizabeth has fled the region and gone to Austin, TX until 2012. Emily is receiving a wide berth from all of us as we fear she may use her knitting needles as weapons. In a stroke of brilliance, Will is negotiating our expectations in a downward direction. Slumped in a chair watching ESPN while simultaneously keeping track of Facebook on his laptop, he grunts when we ask him if he wants support with any craft projects. In a few days, our expectations will be so low that we will be grateful and amazed if he bakes us all a pan of brownies to share or even eats a brownie WITH us. Every night for the last week, Jim has disappeared upstairs to his office to do “paperwork”. I find it very convivial to see one’s spouse five minutes a day. Trying to outlast, outplay and outknit myself this year, I began my craft projects at Thanksgiving with Will’s present my first goal. After all, he is the youngest and has had the least number of normal materialistic holidays. I figure tackling his present could save us on therapy bills later. Good plan… but there have been some unexpected snafus (As one learns, snafus are Homemade Holiday’s defining characteristic). The first problem occurred when I discovered some nameless child of mine had misplaced the electric cord of the sewing machine. When I took it to the store to get a replacement, the owner of the shop had me leave the machine so “his girls” could pick out the right replacement cord. Then in some typical Homemade Holiday freak of nature, the store did not re-open for TEN DAYS as “his girls” never seemed to arrive for work and neither did he. Finally, on my eighth return trip to the store, the place was open but “his girls” hadn’t arrived yet to make a decision about my cord. I took my cordless sewing machine and ran. Plan B required the retooling of a vintage sewing machine that had fallen into our hands a number of years ago- It was the only piece of equipment left in the house down the road which we had to tear down. Many would say the reason it was abandoned was that it too was beyond repair. Anyways……When I mentioned my t-shirt quilt to one of you in an email- perhaps a bit smugly- you sent me several photos of t-shirt quilts you had made. They were stunning- gorgeous- intricate- well quilted- colorful in a zesty but coordinated way- everything my quilt was not. This was very good for my ego which until then had thought my quilt was quite acceptable. I continue to console myself with the knowledge that once the quilt is in Will’s hands, I will never see it again underneath his bedroom piles of gear and miscellaneous clothing. Anyways, I don’t have much time to fret about craft standards. I am determined to finish at least one other present this year, and I have a stocking I am knitting which I have told Jim is for Emily and told Emily is for Jim. Maybe they can share it……..
Here’s to Lynn Tidman, Teddy Grobe, Susan Dam, Lauren Sherman, Adrienne Cedeno, Sarah Ireland, Ashley Dwinell, Liz Taylor, Jayn Bier, Catherine Barritt, David Jonas, Catherine Boorady, Cindy Brady, Pat Laurin, Kathy Skolem, Deborah Cardew, Sophie Cardew, Patricia Wiltse, Yessenia Araya-Mesen, Vicki Ramos-Glew, Masaki Schuette, Jane Taupier, Jessica Miller, Katherine Bernier, Olivia Fauver, Lauren Lenz, Thembi Muhlauri, Sarah Callaway, Caitlin Glasgo and all the Sheehans who have been and/or continue to be Green Hope Farm Staff Gods and Goddesses! While there are millions of things I thank each and every one of you for and so many gifts, talents, insights, humorous world views and general sass that I am grateful that you brought to Green Hope Farm….. today I focus on your patience with the Green Hope Farm bathroom…. So here is an official shout out to you, honoring the fact that you put up with a small miniature substandard windowless pit the worst bathroom in North America- some of you for a brief flurry of months but some of you (and you know who you are, dear ones!) for MORE THAN TWENTY YEARS! 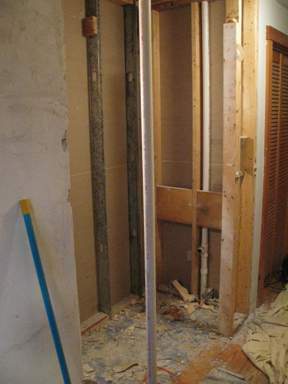 Q: How bad was this bathroom? A: It was so small I frequently thought I was going to crack my teeth on the sink when rising from the toilet. It was so small that not even the smallest bathroom throw rug fit the space. It was so small that it needed a half sized door of just over two feet wide for entering and exiting. Q: Why on earth was this bathroom so small? A: When we built this house, I appeared to think that my children would always be in diapers and never need an actual toilet. Q: Didn’t you think that you might have guests in your home? A: Apparently I expected only hobbits. Q: What was the least pleasant thing about this bathroom? 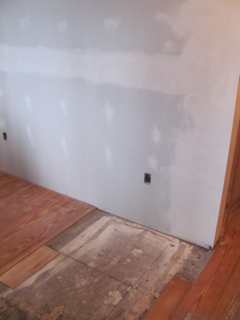 A: It was smack dab in the middle of the house but had absolutely no sound proofing. Anyone in the living room or kitchen could hear way too much. You could recognize the Green Hope Farm old salts because when there were other people in the living room or kitchen, they knew enough to run the water when using the facility ( and I use the word facility lightly- it was the kind of bathroom that made an outhouse seem appealing). Q: How did you try and make this bathroom a better place? A: We made an enormous wall sized collage of your cards so that while there was really no way to use the bathroom, it was always an artistically inspiring and colorful ordeal. Q: What made you decide to do something about this bathroom problem child travesty of a space? We realized we could take a portion of our living room and make it a bathroom entered from the Green Hope Farm bottling room and simply rip out the existing bathroom. A: This time round, hind sight being literally hind sight and of course 20/20, there has been more of a focus on the fact that people need bathrooms and perhaps deserve not to have the entire office hear all about it. Yes, it really was smaller than a coat closet. New toilet about to be set in place by Jay this morning. Jay Waldner is the wonderful carpenter/craftsman who framed our house in 1987. The past few weeks, he has had the pleasure of undoing his own work, ripping out the original “bathroom” he framed out for us when we were young and green in judgement. 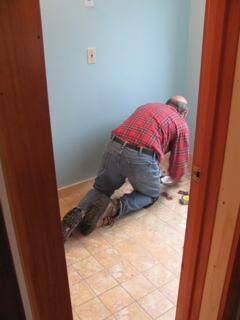 I am particularly grateful for Jay’s presence right now as it represents the first time since Jay left us that Jim has been willing to have help with a project! Big window with view of beehives, oak, pines and lilacs. Real sized mirror replacing tiny antique one that was heavy on charm and light on function. Crap industrial tiles replaced by real ones. Space large enough for humans. As this year draws to a close, I want to report back to all you Earth Angels about what we did with your generous contributions to the Japan project. As you may recall, after the earthquake in Japan, we decided to make a special Flower Essences to send to anyone in Japan who wanted it. Our goal was to send this Flower Essence mix free of charge with Green Hope Farm covering the cost of the Flower Essences and any of you who felt so inclined defraying postage costs. In response to our idea, you flooded us with contributions for postage, and many people from all over Japan asked for the Flower Essence. To date, we have sent over 1100 bottles of this Flower Essence mix to Japan. Postage for every package was paid for by you! We continue to offer the mix to anyone in Japan who would like it’s support. In early days, many bottles of the Flower Essence mix were walked into territory near the center of the damage. Later, bottles continued to go out to the hardest hit areas as well as to people all over Japan who were concerned about radiation and dealing with the trauma as it affected the entire country. Tomoyo Rezvani was a key person in getting Essences to all parts of Japan but many, many people distributed the mix, often in very courageous ways. A number of you broadened the scope of your gifts and made gifts for Flower Essences for rescue animals and also people in this country affected by events like the tornadoes in the south. We also continued to give Flower Essences to those who can’t afford them, and a number of Earth Angels supported us with that effort. One particular Earth Angel created a fund for folks with financial concerns to receive Flower Essences at the close of their lives. Sharing Essences in this way has been very moving for those of us here, and we have heard some wonderful stories of gentle deaths supported by the Flower Essences. My deep thanks to each and every one of you who gave so generously! Please know we will continue with all these efforts! 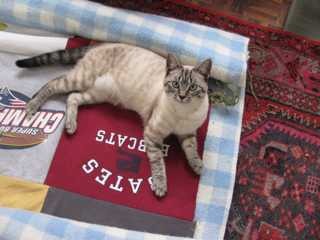 One postcript- Our work with rescue animals got wonderfully hands on this month when this dear rescue cat joined us. Pippa is a wonderfully spunky feline with an engaging personality. She quickly made friends with all the cats, dogs and people living and working here. So far, she likes to spend her days in the office watching us pack and ship orders. At night, she is in the middle of every craft project with a particular affinity for yarn. She has all of us laughing at her joyful antics. Jim is usually the brakes in our family when it comes to more animals, but Pippa won him over in a heartbeat.